I'm ten days out of ACL reconstruction after a ski injury on April 5th. I'm a 42 year-old woman and a healthcare worker in France, and I needed to wait until my Christmas "break" to be able to have the surgery. I've been using a DonJoy brace for work and cut back all sports acivities except biking, as anything else was too painful. Towards the end, I had to cut back even on that, as I also had a meniscus tear (one-ninth of the meniscus was removed during my surgery) that was causing pain. My surgeon is well-known in this ski resort area for this kind of surgery; he does over 200 ACL operations a year. We decided to go with a Kenneth-Jones (patellar tendon) as opposed to a DIDT (hamstring), although he practices both techniques. In France healthcare is a bit different from back home in the States: I checked in to the clinic the night before surgery and was released on Day 3. I had general anesthesia due to a blood clotting factor problem, which ruled out spinal anesthesia. I was given a femoral nerve "block" lasting about 15 hours post-op and was put on IV pain meds and anti-inflammatories for the first 36 hours, which were very effective for pain control. In fact, I was expecting some horrible pain for the first days as I'd read many worrysome stories about ACL surgery recovery, but this happily has not happened so far. My pain level has yet to rise above 2 on a scale of 10, and when immobile the pain is 0. I'm able to massage it to break down the adhesions with little discomfort. I had a brace and crutches on Day 1, and was able to put full weight on the knee without pain. By the time I left on Day 3, the brace was no longer necessary except for sleeping and the crutches were more of a hindrance than a help, but I was told to use them for at least two weeks. I was discharged with a rehab protocol to follow with a therapist. Right now I go four times a week and it's lots of massage, quad sets, passive stretching, and "closed chain" exercises. Everyone, including the surgeon, seems surprised that my recovery seems to be going so well. He told me my leg would turn deep blue but so far that hasn't happened, it's a bit yellowish in places. I have full extension already, can easily bend to 90° but have been told not to go beyond this for the time being. I can also do straight leg lifts but for now these too are "off limits"--in fact, I'm being told by practically everyone not to push things too quickly or else I may stretch the graft. 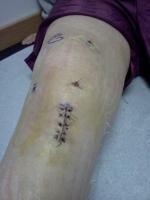 My knee is sore to the touch, but not painful, and only in the area of the graft. It does feel heavy and I walk with a limp-but I'm not even two weeks out and I'm walking. So...so far, so good. I elevate and ice it often and wear support stockings. If the end result is as good as the beginning, then I'll be thrilled. In any case, I think I wasted a lot of time worrying about the pain of this surgery. There's obviously a big difference in individuals and also in pain management techniques out there. Not to seem critical, but I can't help but wonder if post-op pain can really be well-managed if you're sent home two hours out of the O.R... I'm also curious as to whether patients in the US are sent home with drains. For me, I really think the drain made a big difference and I'm glad I had it for 48 hours.